iRocker Vs. Tower Paddle Boards – Which to Buy? In a quick growing market, selecting a trust worthy brand has become a difficult task. However, true pillars of paddle boarding are yet to be dethroned as they thrive to fulfil the needs and requirements of every paddler out there. Hence, today, we will witness the clash of the two titans of the industry to unveil the superior manufacturer and the reasons behind it. 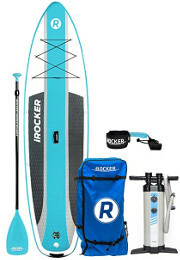 iRocker and Tower are two premium, American made paddle board brands. They’re built by serious SUP”ing enthusiasts. Thereby, they’re neck in neck battle. When comparing iRocker vs. Tower side-by-side, there are a lot of similarities, like solid build quality and features, but there’s a lot of differences too—some subtle, others, not so much. 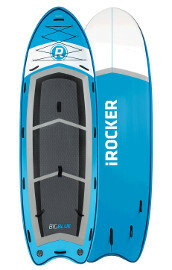 Starting with the older brand here, iRocker is a true leader in the industry of paddle boarding. 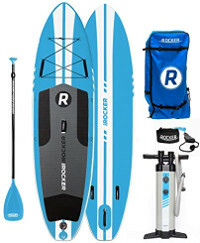 Indeed, one can say that iRocker revolutionized paddle boards as they have created an decent selection of inflatable paddle boards to suit the different needs of all paddlers out there. Thus, let us take a look at some of the brand’s finest boards and figure out what makes them stand out from the crowd. The Cruiser is an all-around paddle board that was created by iRocker to cater for a wide category of paddlers. Indeed, this board measures 10 feet 6 inches in length, 33 inches in width and 6 inches in thickness, making it an exemplary board for anyone who is looking into discovering the sport as well as those who seek a stable paddle board. Hence, the Cruiser is definitely not a racing iSUP but it is still capable of handling most environments with ease which will highly appeal to beginning and amateur paddlers. 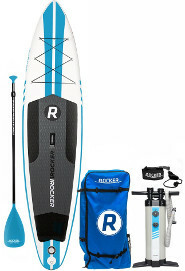 The iRocker Sport iSUP falls into the more specific category of boards where it is targeting paddlers who are willing to take their passion to the next level. In fact, quality is pretty much the same on all iRocker boards (premium) but the size of this board is what makes it great for racing / touring. Indeed, at 11 feet in length, 30 inches in width and 6 inches in thickness, this board is designed to give you more command but less stability which will push you to sharpen your skills if you want to stay on top. An all around board is typically a name for a beginner stand up paddle board and this iRocker fits that spot perfectly. Truly, this board is designed to induce stability and minimize agitation which can be deduced from its progressive width and average length. Thus, if you’re someone who wants to be initiated into the sport with minimal obstacles then you’d be rather delighted with an iRocker All-Around SUP board because it will take care of everything for you. The Big Blue is what you would call a party board as it falls into the category of multiple passengers’ big SUP board. Undeniably, this board is a giant and that becomes evident once you realize that it measures 13.5 feet in length, 50 inches in width and a staggering 8 inches in thickness. Accordingly, this board might not be so snappy but it is capable of handling up to 4 passengers easily, allowing you and your family / friends to enjoy a joyful summer together. 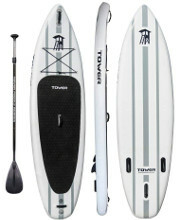 Tower Paddle Boards is a highly reputable brand with enough ambition to take down any brand in the industry. Truly, this is a name that is often synonymous with quality, variety and reliability which are the three criteria that make any board a great one. 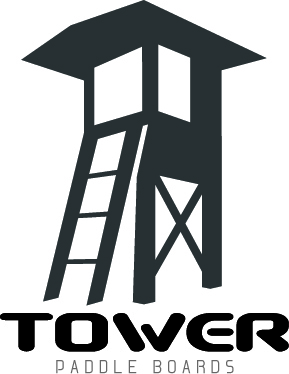 So, what makes Tower a towering brand despite the vicious competition and what makes it a variety brand? Like every other prominent brand, Tower seeks to fulfill the needs of potential paddler’s by introducing them to a well-balanced board that will give them a smooth entry to the sport. Indeed, the Adventurer 1 is a great beginner’s board because it is designed to guide new comers and facilitate their access to water sport and that can be seen in the smallest details. Hence, this board measures a universal 9 feet 10 inches in length which is great for youth / adults, 32 inches in width for enhanced stability and 6 in thickness for a resilient and sturdy hull. Since round edges are often synonymous with entry-level boards, Tower decided to go with a pointy lifting nose for this board to quickly overtake the Adventurer 1. Indeed, the board at hand (Adventurer 2) is a premium quality iSUP that was developed for amateur paddler’s to be more responsive and even a little feisty. Hence, this iSUP stands at 10 feet 4 inches in length, making it the right size for youth and adults, 32 inches in width for better stability and 6 inches in thickness to maintain a solid form throughout. In attempt to branch out to more paddlers, Tower decided to invest in a racing board, which turned out to be one of their best creatures. In fact, this board is one of the few in the industry that is actually designed with a racer in mind. Accordingly, the iRace makes quite the rival for most premium racing boards on the market as it measures a sublime 12 feet 6 inches in length, 30 inches in width for improved manoeuvers and 6 inches in thickness to keep the board from bending at the center under excessive weight. Hence, the Tower iRace is easily one of the best racing iSUPs out there and this one, you can actually afford. This right here is a majestic inflatable paddle board that was made by Tower in order to take over the touring / racing realm. Indeed, one look at the Tower Xplorer can give away just how much character it has and that is further confirmed via its dimensions. Hence, this iSUP measures an astonishing 14 feet in length in order to override any environment and keep you on top. Also, the Xplorer stands at a fairly stable 32 inches in width and a highly dependable 8 inches in thickness for all the extreme scenarios this board will get you through. Thus, the Xplorer is an impressive racing / touring board with enough precision on both profiles to make you feel like you own two separate boards. Tower paddle boards vs iRocker: So which one is best? Now, let’s premise this segment by acknowledging that there is nothing that we will say that would necessarily make one brand better than the other because only you can decide that. Hence, to make it even easier for you, we will propose a direct comparison line on various aspects between these two giants & hopefully you’ll be able to make a choice before you finish reading it. Let’s start by what we consider one of the highest commodities in the industry. Variety of choice is by far the biggest seller in this domain because those who provide more options end up landing more dedicated customers. So, which of the two brands masters this craft? First, iRocker is considered to be rather decent in this area as it features a variety of boards for different types of people. Indeed, whether you are into racing, touring or complete beginner, it’s almost guaranteed that you’ll find your match in their arsenal. Nonetheless, it is important to note that the brand only offers 6 different choices and that certainly leaves some of us behind. On the other hand, Tower is definitely the leading champ when it comes to variety as it provides over 15 boards to choose from. Indeed, the brand has definitely dedicated a lot of effort to creating a special board for every paddler out there and that earned it the right to brag as the leader of variety. Further, Tower doesn’t only provide variety in sizes but also in shapes, colors and board character for an even more fulfilling paddler experience. Quality is undeniably a big deal, especially for inflatable boards which is why you’ll discover that most brands out there go all the way to avoid looking and feeling cheap. However, in a world of equally resilient boards, how can you tell which is better? Well, Tower is a brand that often takes pride in its boards based on quality alone, which makes sense since their boards are multiple layers thick. In fact, all Tower paddle boards are made of extremely durable military grade PVC fabric labelled Hypalon, which is found in most whitewater rafts. Further, to put the hull together, Tower goes for a high intensity machine operated drop stitching process that renders every board unbreakable. Hence, you can expect these boards to take constant abuse and torture without complaining and that can rarely ever be said about something filled with air. On the other hand, iRocker has definitely established most of its reputation due to its high quality boards and that did not come easily. Hence, all iRocker boards feature a quad layer construction with 4 layers of protection of high resistance industrial PVC. Further, to make the perfect seal, the brand invested in dual fusion heat welded seams with a high density drop stitch internal core that exhibits maximum stitching per square inch. Therefore, it is definitely impossible to poke, puncture or rip this board apart as it is built to outlast generations of users. Features have become a big deal for paddlers and especially those who fell in love with inflatable SUPs. Indeed, nowadays, you cannot find a board without certain features that we have grown highly dependent on from first encounter. Our first thought was to compare both brands on the basis of which one has the best features but it turned out to be quite a difficult task since both Tower and iRocker exhibit very similar features on each of their boards. Hence, both brands take a keen interest in cargo nets except that iRocker goes for 6 connecting D-rings whereas Tower goes for a standard 4. Further, both brands feature splendid gripping pads of equal quality and pretty much equal ratio. In terms of navigation, the two brands also go for a similar triple fin approach to allow for straight tracking and easier manoeuvers. All in all, you can pretty much say that you’re getting the same exact deal on both ends. Accessories have always been a big deal for us and for every paddler out there because they can truly make the difference between a fun joyful experience and a pain in the back. Hence, this is the time for these two brands to rise and shine & hopefully help us determine a winner. Tower is known for being a rather shy brand when it comes to packaging as it often opts for minimalism. However, that hasn’t always been to our advantage. 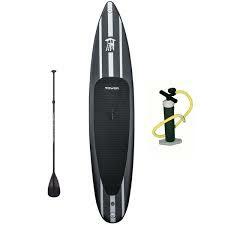 Thus, most Tower paddle boards are shipped with a hand pump and a high quality paddle but that’s about it. Thus, if you get a tower, you’ll definitely end up looking on the other side of the fence out of jealousy or you can pay more to get other accessories that you might need. Nevertheless, one thing that we can’t argue with is that Tower ships its boards with all the accessories you’ll need & that’s it. 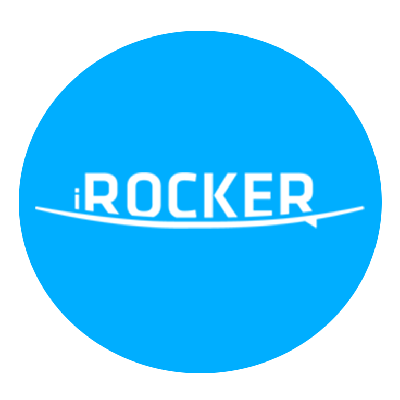 As far as iRocker goes, you will quickly find out that this is a brand that likes to spoil its customers. Hence, iRocker might cost a little more on average but it definitely makes up for it with a rich package. Accordingly, you can expect to receive every little accessory imaginable with your board free of charge and that includes a dual action hand pump, a paddle, a backpack, an ankle leash and a repair kit. 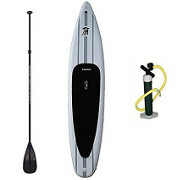 In conclusion, you can easily argue that one brand is better than the other and that would be justified because iRocker is definitely better at accessories but on the other hand, Tower offers a wide variety of inflatable paddle boards. Therefore, we dissected both brands for and now it’s up for you to decide which one is the best in your opinion and we would love to hear why you have chosen one and not the other.